An awesome new restaurant opened up downtown, Zaza‘s. We had a group ride that ended there about a month ago. It is so good that we sat outside and waited an hour for them to open. Oh, and they gave us coffee and pastries while we waited. If you are here, check it out. This is so great. I’ve taken up cycling but have nobody to do it with I wish I could come back to Birmingham and ride with y’all! 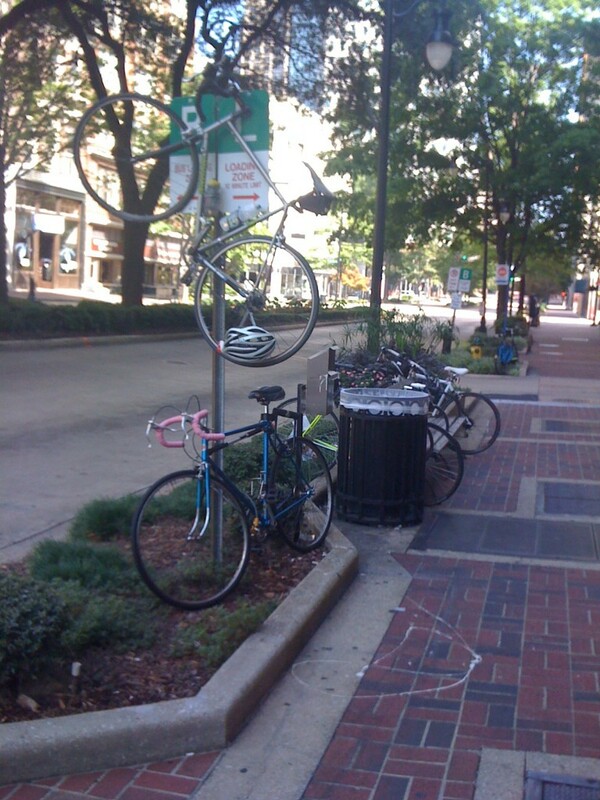 Bike racks? In Birmingham? HA! There IS a bike rack down the block…2 of us were locked to it. The rest of us made do just fine! Ha…this photo made it onto today’s Bike Snob NYC Friday Fun Quiz. You’ve hit the big time now! Hmmm… wonder if I could park my tandem vertically like that.